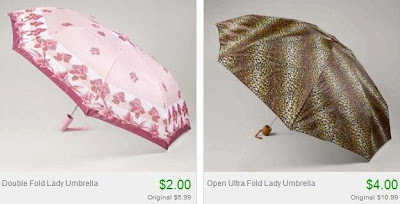 $2.00 Umbrellas + 10% Off or Free Shipping! As I mentioned in the previous post, Totsy is having tons of blowout sales tonight. I wanted to point this one out because there are super savings to be found! Check out the Umbrella Event to find ladies umbrellas for only $2.00! There's lots of different styles to choose from with the most expensive umbrellas only $4. If this is your first Totsy purchase, you'll also score free shipping on your order! If this isn't your first purchase, use the code couponcabin to save 10% on your order.